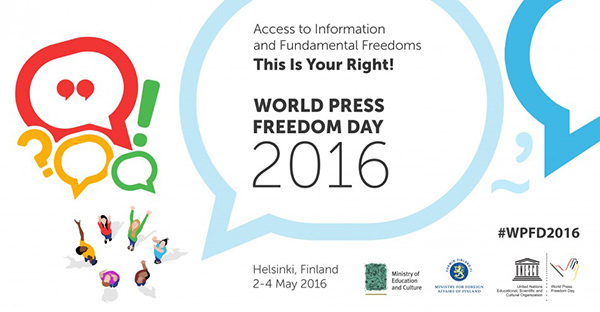 One way to honor World Press Freedom Day: Imagine that world without broad access to information. Maybe it’s because I just came off a whirlwind week of journalism events—conferences hosted by Unity Journalists, the Society of Professional Journos, and the annual E.W. Scripps awards dinner—but there may be no better time to tout the value of a free press. Renew or subscribe to a news source you value. Share with others great coverage you cherish, whether it’s about your community, your nation, or your world. And don’t forget to hug a journalist. A panel discussion on Friday, October 17, will cover recent changes to the Arizona rules controlling use of mobile devices in courtrooms. 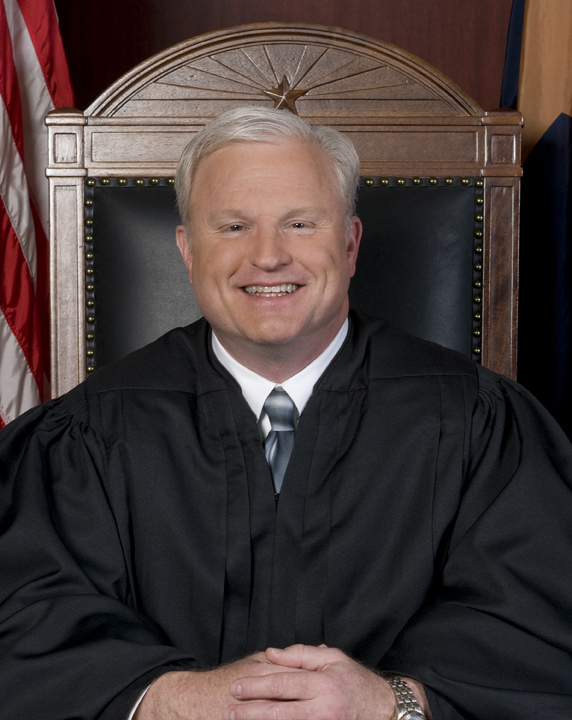 Sponsored by the First Amendment Coalition of Arizona, it will feature Justice Robert Brutinel, who chaired the 2013 committee whose recommendations led to the changes. Those changes specifically were made to Supreme Court Rule 122.1 (use of mobile devices in courtrooms) and Rule 122 (video, audio and still photography in courtrooms). The discussion will be held at the ASU Cronkite School of Journalism in downtown Phoenix. The RSVP page (and more information) can be found here. The local chapter of the Society of Professional Journalists is a member organization I’m proud to call home. And that chapter is a charter member of the First Amendment Coalition. I hope you come out to join journalists, lawyers, law students and others as we hear about this important and evolving topic. This next item is a little market-y. Let me state that up front. But if any of you have marketing and communications professionals in your firm or office (or if you do that work yourself), consider stopping by ASU SkySong tomorrow morning. That’s where you’ll get to: (1) hear directly from news professionals across multiple media, (2) pitch your story (if you’d like), targeting your idea/story to the channels and niches that best serve your goals, and (3) have coffee with me. OK, that last one may not be a big draw. But this is about my third year participating in the Society of Professional Journalists event, and it’s terrific. It includes some great panel discussions, followed by speed-pitching. Communications pros are there pitching ideas to TV, radio, newspapers, and even us monthly magazine folks. Over the years, I’ve heard quite a few great pitches. But the great part about it is the speed-dating quality. A few minutes’ investment gets you some feedback, at least, and maybe a bite on the line. The location, again, is 1475 N. Scottsdale Road, Scottsdale (2nd floor of SkySong 1 building, the NE building of the complex). Oh, what a luxury it is to be learning. As I’ve said before, people learn in all kinds of ways. I’ve had great luck with the podcast and the webinar. But it is hard to beat the occasional face-to-face gathering, where you are not tempted to multitask as a national webinar streams into your office. Sure, it may be more challenging for busy folks to attend in-person conferences, but boyoboy they still have a place in professional education and development. For example, I am always on the prowl for the best way to cover Arizona’s legal profession. How does a small staff analyze and share what’s important for a state full of attorneys? I am sure that lessons I learn in Anaheim will help me in that challenge. And the conference website is here. There is a telltale sign that this is a valuable conference: Using the terrific conference app, I started building my own schedule of preferred seminars. Much to my chagrin, in every single time period, there are competing seminars I want to attend. That, I assure you, does not happen at every event I attend! Like all learning, the seminars run the gamut from skill-building I can use this week all the way up to aspirational tools that might improve Arizona Attorney Magazine next year. But it will be good have the mental gears turning. When I return, I’ll give you a roundup of my takeaways (and whether I met with Mickey Mouse). He calls that messy? 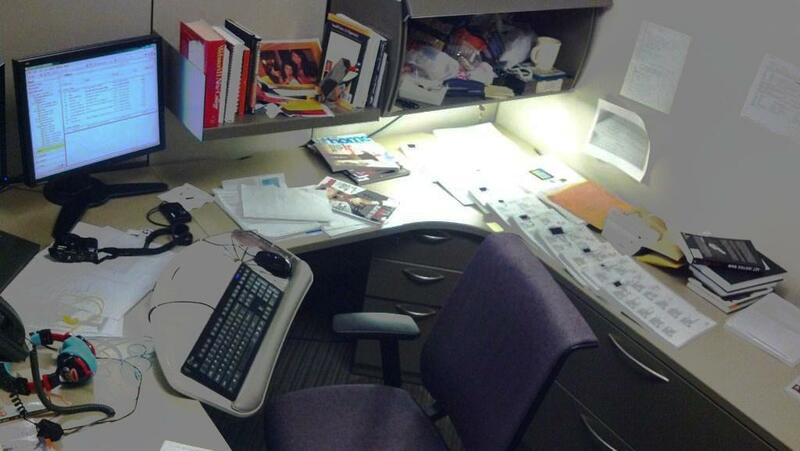 A submission from @jwswrites of his messy desk (on http://spjdesklove.tumblr.com/). 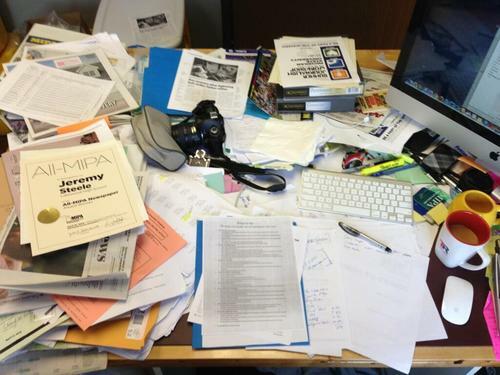 I’d wager the following: Anyone who has a cluttered workspace will claim that they really really really do have a system, and that it works for them. They may even go so far as to say that clutter is the sign of an active mind. Residing among my own stacks in the cluttered category, I’ve tried floating those old canards myself. The truth is, of course, that efficient and effective people land all up and down that continuum from “hoarder” to “frighteningly neat.” Whatever works for you, works. I did not submit my space for consideration, but on Change of Venue Friday, I thought I’d share it with you (see below). The image in this post represents a relatively neat period in my own pendulum swing. Don’t judge. And how about you? Are your stacks and your clutter an ongoing challenge? Have you tamed them? If so, how? (And I really mean it: HOW? I want to know!). 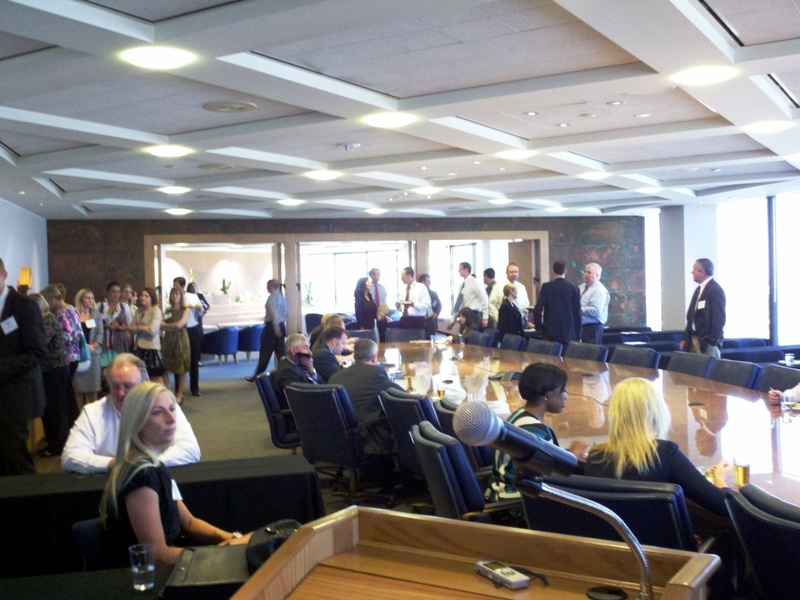 Attendees gather for a Legal Marketing Association event featuring a panel of in-house corporate counsel, at Snell & Wilmer, Phoenix, Sept. 26, 2012. This week, I get to interact with many communications and PR professionals, and that leads me to wonder: Could their best practices align quite a bit with those of lawyers? That thought occurred to me as I prepared to moderate a Wednesday panel at Snell & Wilmer for the Legal Marketing Association. The panel was comprised of in-house corporate counsel, and the audience included both lawyers and communications folks. It was a blast, and I continue to be impressed by the deep level of commitment and quality that emanates from the LMA. As I said in my opening remarks, their story pitches and sharing of information are what allow us to cover our beat well. But story pitches—and lawyers—are much on my mind this week, mainly because of a panel I will sit on this Saturday. 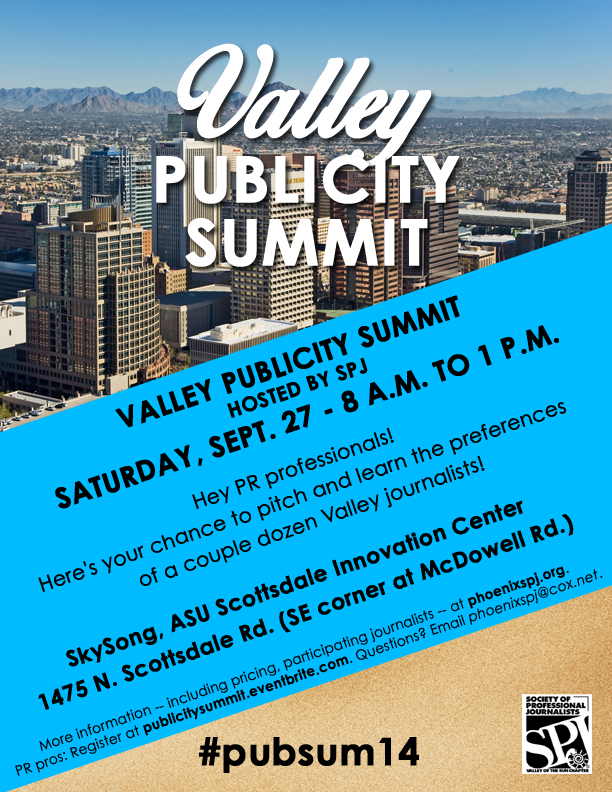 The “8th Annual Publicity Summit” is co-hosted by the local chapters of the Society of Professional Journalists and the Public Relations Society of America. (Could those organization names be a little more intimidating, please?) 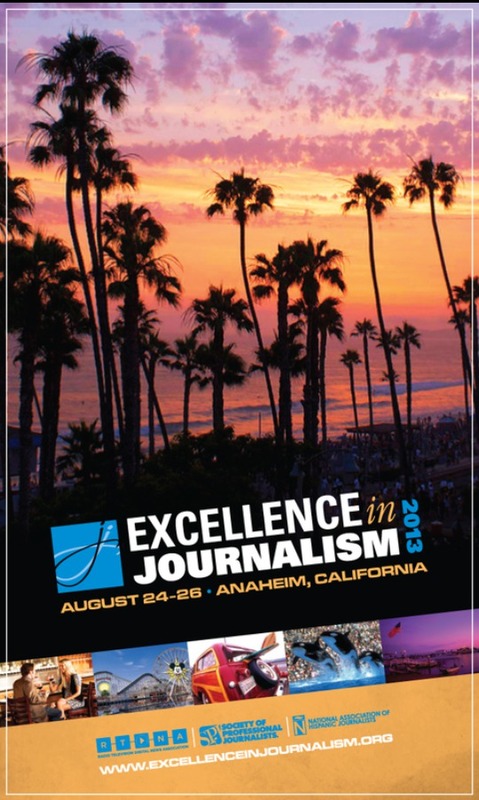 I’ve been in the SPJ for years, and I’ll be on a panel of magazine editors, writers and reporters. It will be in the downtown Phoenix ASU Cronkite Journalism school. Please stop by to say hi if you’re there. If Saturday’s group could learn anything, they should hear from members of the LMA, who routinely impress me by how well they can educate the media about lawyers and their accomplishments. So what will the journalists be telling the PR folks? What we love love love in story pitches—and, conversely, what may be less than effective when trying to get your content placed. The lessons that will be explained on Saturday should help those communications professionals (and us media attendees who may get great pitches). But it occurred to me that they are the same lessons that lawyers should take to heart when connecting—either with magazines or with each other. Here is some of what I’ll discuss at the SPJ event. What other lessons would you add? Learn before you call: Like most media outlets, our magazine is available online. Plus, my own material is available via Facebook, Twitter, LinkedIn, Tumblr, our website, etc. Given that, opening with “So what do you do there?” or “What kind of stuff do you guys publish?” is the path toward a very short conversation. And that’s true for lawyer connections, too: Read all you can about someone before striving to make a connection. Read our stuff: This is related to the first point, but it’s worth being explicit. Lawyers and magazines have an awful lot of their record “out there,” and it’s available via the web. Using Google to spot significant verdicts that have gone their way (or not) will help make your ultimate conversation more informed (even if you don’t explicitly bring up that searing loss!). Connect where it makes sense: Sending blanket queries to everyone and her sister simply does not work. 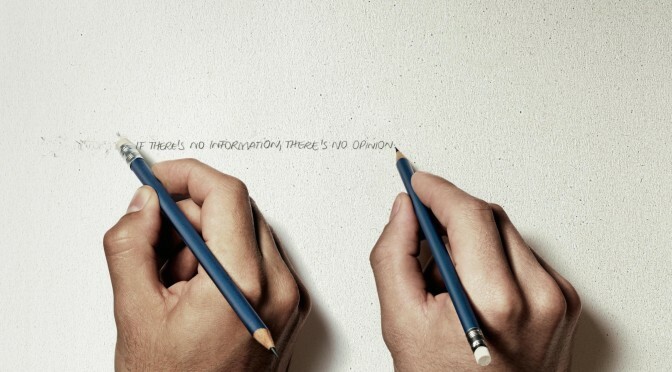 Story ideas should be tailored to the publication and its audience. Similarly, lawyers don’t cotton to outreach that looks to have all the individuality of a widget. Reveal yourself: When you reach out to someone, let him or her know something about you and/or what you represent. Be sure your email signature provides access to relevant information. And don’t hesitate to provide links to other content that you think will make your connection to the other person more sensible. Here’s to valuable connections! Have a great weekend.